This Lab will include examples of encrypting EBS volumes and S3 buckets. It's important to understand that once setup is implemented, from a user's perspective the encryption of data is transparent. For example, if you look at a text file on an encrypted volume it is readable. That is because the encryption is not on a file by file basis, with some being encrypted and some that are not. Encryption takes place at a lower level (the operating system level). If you view a text file the decrypted file is displayed. Similarly for S3 object storage... you can still view text files, images, etc. What volume encryption protects against is if someone gains physical access to the drive with the encrypted data on it. If they don't have the Customer Master Key (CMK) they cannot decrypt the contents. 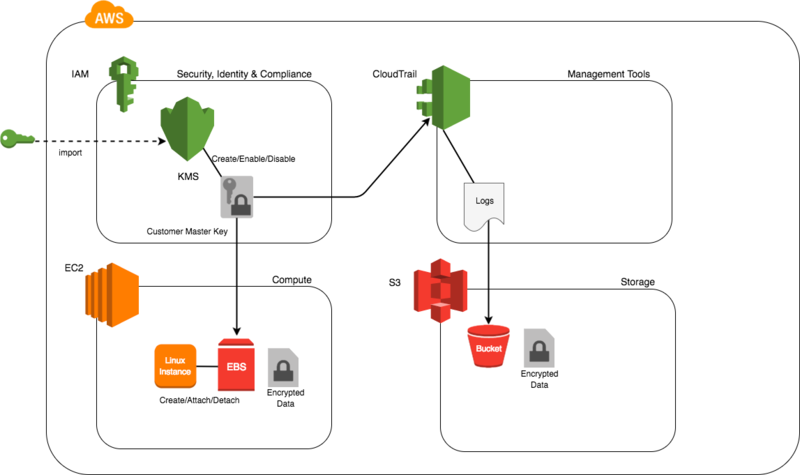 Although not the focus of this Lab, realize that just because KMS is integrated with many AWS services, KMS can be utilized without other AWS services. What good does that do you might ask? Consider the following use case: an internally developed banking application that uses no AWS services or infrastructure. Even though the application uses infrastructure in their own data centers, and encryption keys with key material they generated themselves, there may be many keys to manage. You can generate your own key material and KMS can store and manage all of it, including helpful maintenance functions such as key rotation and scheduled key deletions. Even if someone gains physical access to disk arrays in their data center, they will not be able to gain access to the data. They would need the encrypted keys uploaded to and managed by AWS KMS.